1. Heat 1tbs of the olive oil in a large frying pan over a medium-high heat. 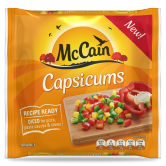 Add McCain Diced Capsicums and saute for 4 minutes or until soft and cooked through. Add balsamic vinegar, stir and remove from heat. 2. Meanwhile, toast the sourdough and rub cut side of garlic over 1 side of each piece of toast. 3. Place sourdough on a serving platter, spread capsicum mixture evenly over the toasted sourdough, sprinkle with feta and fresh basil, season with freshly cracked sea salt and black pepper and serve immediately. 1 Heat 1tbs of the olive oil in a large frying pan over a medium-high heat. Add McCain Diced Capsicums and saute for 4 minutes or until soft and cooked through. Add balsamic vinegar, stir and remove from heat. 2 Meanwhile, toast the sourdough and rub cut side of garlic over 1 side of each piece of toast. 3. 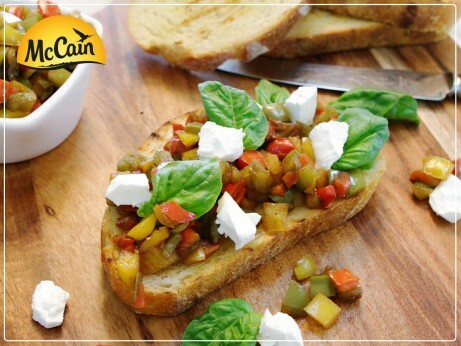 Place sourdough on a serving platter, spread capsicum mixture evenly over the toasted sourdough, sprinkle with feta and fresh basil, season with freshly cracked sea salt and black pepper and serve immediately.